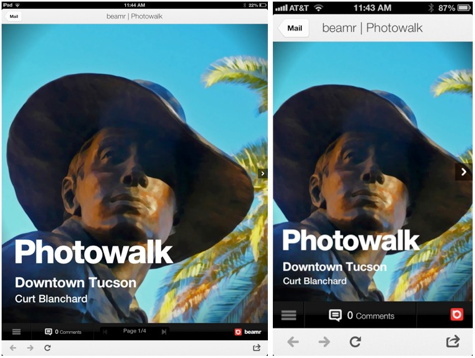 With beamr you can easily make what appears to be a virtual magazine by choosing photos from your iPhone’s Camera Roll. Click the Create button and you’ll have a link to share with friends by email or by posting on social media sites. Your photos appear full size and can be downloaded by your recipients. The process is really simple. You can type a title for your magazine’s cover and add a bit more copy such as a date and a credit line but other than that, you’re done. With intuitive ease-of-use comes a few compromises: You cannot add captions to individual photos, some photos will appear two or three-to-a-page while others are full page but you cannot control which ones get which treatment. Click on any small photo and it will enlarge to full screen size. This layout changes depending on the device being used to view the magazine. Cover and inside page as seen on an iPhone screen. If you are an iPhonographer, you can make handsome portfolios with beamr. Just understand that all of the photos are downloadable by those who view them. Sharing a magazine full of photos from a family get-together or event is fun and it’s very easy. Beamr is an iPhone app, but the magazines you create can be viewed on the iPad or opened with any browser. 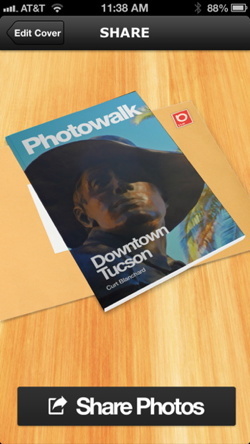 Same cover viewed on an iPad (left) and and iPhone (right). At the end of each magazine there is a sharing page. Here you’ll find a views counter, a Tweet button, a Comments area, and a circular icon with a downward-pointing arrow. Many will recognize this as a download button but it’s not labeled as such and one click on it will download all of the photos onto whatever device the recipient is using. If there are many photos, this could be a surprising inconvenience. This button needs to explain what it does. A checkbox adding your creation to Facebook is checked by default. Deciding to share your images on Facebook should be a personal choice, not done automatically. 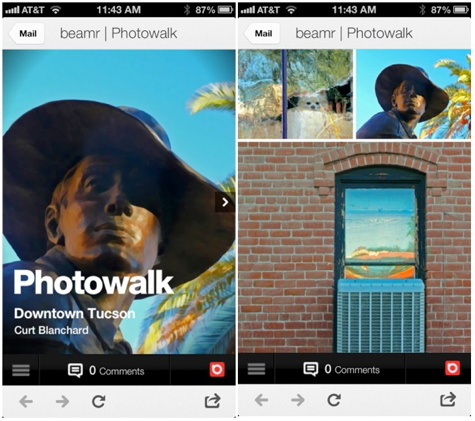 As an informal way to share photos with friends and family, beamr is quick, easy, and fun. With it, you can put together a nice magazine full of photos from your Camera Roll in a matter of minutes. Future versions will undoubtedly fix some of the minor flaws but even in it’s current state, it’s terrific, casual fun.